PERSONALIZED "She Leaves a Little Sparkle Wherever She Goes" Blank Writing Journal to Write in, Black & Pink Cover! Customize the cover with your name. Simply leave a note at check out with the name of you would like on your journal cover. Looking for the best gift to give to the person whose sparkle always bring happiness to everyone? With its elegant and beautiful design, this Blank Journal Notebook with Lined Pages features the motivational and uplifting quote "She Leaves a Little Sparkle Wherever She Goes" that is sure to provide the inspiration you want! Each lined page has the motivational message at the top to inspire you to always remember to leave your mark wherever you go. 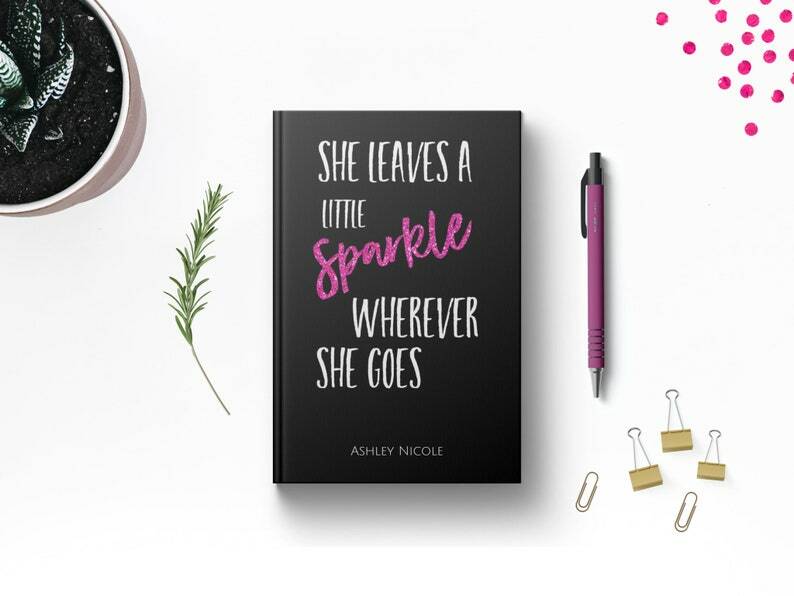 She Leaves a Little Sparkle Blank Notebook Journal to write in is the perfect gift to daughters, students, family, friends, girlfriends, co-workers, and neighbors...just about anyone! Makes the perfect gift idea for girls, college notebooks, graduation gifts, birthday gifts, back to school notebooks, Christmas gifts, friendship gifts, and just about any occasion. Can be used as a personal diary, writing journal, or to record your personal thoughts, goals, and things to remember. • Features the words "She Leaves a Little Sparkle Wherever She Goes" on the gorgeously designed black, pink and white cover. • Add your name to the cover. Simply leave a note at check out with the name of you would like on your journal cover. She Believed She Could So She Did Personalized Custom Name Blank Writing Journal. Inspirational Quote Hardcover. Women Friend Graduate Gift. Personalized No One Is You Journal. Inspirational Positive Quote Gift Idea. Friend Daughter Mom Wife Women Teen Girl Graduate. Custom Name. Journal was absolutely perfect. Great Quality, Exactly What I Was Expecting ~ Although, I actually thought the word "Sparkle" had glitter ~ it does not. This absolutely takes away nothing from the journal and I am excited to give this gift!! Personalized She Believed She Could So She Did Journal. Inspirational Positive Quote. Gift Mom Wife Women Girls Teens Graduate. Custom Name.